The OS81119 is a dual network port Intelligent Network Interface Controller (INIC) for the 150 Mbps INICnet Network with support for both optical physical layers (oPHY) and coaxial physical layers (cPHY) that can efficiently handle audio, video, packet, and control data for infotainment and Advanced Driver Assistance Systems (ADAS). The cPHY enables daisy chain INICnet 150 Networks with the support of full-duplex communication, reducing the total system costs through the reduced number of cables and connectors. The classic ring topology with dual-simplex communication is supported by oPHY and cPHY. Hybrid topologies combining ring and daisy chains are also possible, providing additional flexibility. The OS81119 offers industry-standard interfaces to peripheral components: I2C, I2S (and similar formats) audio streaming ports, MediaLB, SPI, USB 2.0. The MediaLB and USB ports support all data types (stream, packet, control) simplifying connections for a wide variety of applications. INICs include a powerful stream-data routing engine that links application ports to network channels and allows dynamic reconfiguration. Microchip’s Unified Centralized Network Stack (UNICENS) supports establishing of all network connected data resources from one point in the network, enabling simple, yet full featured network connections. Software support for interfacing to the INIC’s data I/O ports in Linux applications is provided by the native driver included in Automotive Grade Linux. A QNX driver for the USB interface is available. For MOST implementations, a variety of software support is available. INIC encapsulate all low-level network-management functions relieving the External Host Controller (EHC) from the burden of managing real-time network tasks. INICs monitor and manage a variety of network conditions to support robust network functionality and fault detection and recovery. A built-in watchdog protects the network from EHC faults. INIC protection mode prevents application malfunctions from influencing the integrity of the network and system. INICs also provide support for device power management. Remote control functionality is supported obviating the need for an EHC in certain, “slim” applications. The INIC can be fully configured and managed through the network. Peripheral components can be configured / monitored via I2C tunneling. Optionally IP-based system management can be supported via the Ethernet packet channel providing seamless integration of the multimedia network with Ethernet networking in other vehicle domains. 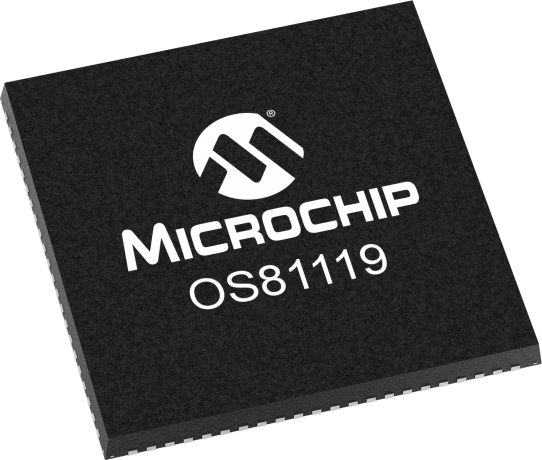 To purchase the OS81119 or obtain additional information, please contact any Microchip sales representative or authorized worldwide distributor. * Ring topology is not available on all ports, if coaxial PHY is used. ** Required only when the HSIC interface is used.